Jon Osterhout is a big man with big ideas for his football team. A former All-American offensive lineman at Sacramento State, football has been Osterhout’s way of life since his freshman season in 1995. 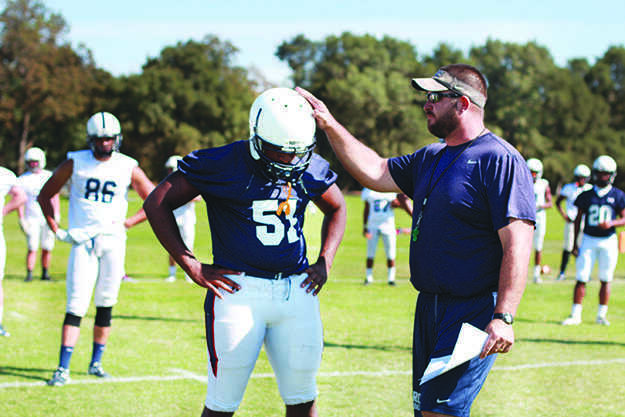 American River College football, however, has been his job since he joined the staff as offensive line coach in 2011, a season in which the team went undefeated. “I was fortunate enough to be in that 2011 season, when we won all those games and went undefeated. It takes a certain group of individuals, and it takes a coaching staff that’s committed to helping players evolve and develop,” said Osterhout. Osterhout has clear priorities for what responsibilities he and his staff have to fulfill in regards to the athletes on his team. “I think first and foremost it’s the success of them academically,” said Osterhout. But there still is—and always will be—a lot of focus on the team’s success. ARC’s football team hasn’t had a losing season since 2007, and for the first time since that year, Jerry Haflich won’t be the man in charge. That’s a lot of pressure for a first time head coach. Osterhout is counting on the precedent that has been set in previous years to provide an example for what is expected. “It’s the culture that’s been built here over the course of the previous three seasons I’ve been here. We’ve been able to continue to evolve and keep the program here moving forward,” he said. Osterhout brought 11 years of Division I coaching experience with him to ARC, spending two stints at Sacramento State and one at University of Nebraska, while notable NFL defensive linemen Adam Carriker and Ndamukong Suh passed through as he mentored them from his position as a graduate assistant. With that experience, if things go well at ARC, could Osterhout be tempted by a shot in Div. I? “Not really. I took a run at that for the previous 11 years, prior to coming to American River College, and at the end of the day I have a six-year-old son and a three-year-old daughter,” said Osterhout. How long will Osterhout be at ARC? “As long as they’ll have me,” Osterhout said with a laugh. Be the first to comment on "Football season kicks off with new head coach"